Maj. Gen. Charles Cleveland, vice director for intelligence, joint staff with the Defense Intelligence Agency, is moving to the National Geospatial-Intelligence Agency to serve as director of operations and military deputy. He will enact duties for his new assignment in Springfield, Md., the Defense Department said Monday. Carlos Curbelo, R-Fla., Stephanie Murphy, D-Fla., and Adam Schiff, D-Calif., sent a letter to National Intelligence Director Daniel Coats on Sept. 13 expressing concern over the possibility that “malicious foreign actors” could use advanced technology to produce “deep fakes”—fraudulent audio recordings, images or videos that are virtually indistinguishable from authentic ones—to blackmail individuals, sow disinformation and potentially threaten public discourse and national security. 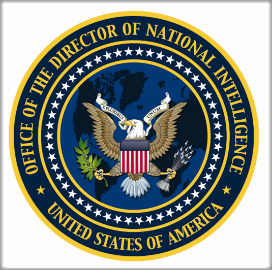 Jason Klitenic, former deputy general counsel at the Department of Homeland Security, has joined the Office of the Director of National Intelligence to serve as general counsel. Daniel Coats, the director of national intelligence, swore in Klitenic, following the appointee's Senate confirmation last week, the DNI said Monday.